Come along with Jason, a student from the U.S., and Lydia, a girl from Mexico City, as they journey through Mexico and explore its rich history and culture! 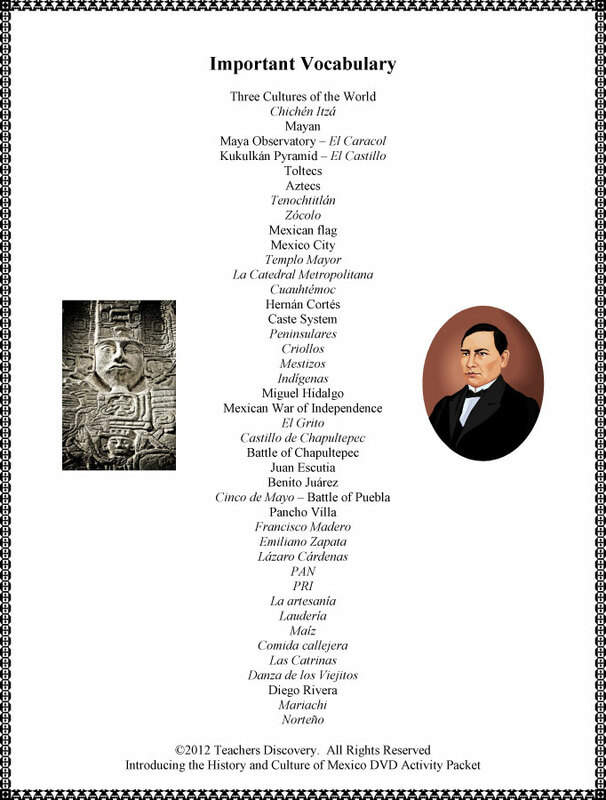 Discover and hear about the ancient cultures of the Mayans and Aztecs, the Mexican War of Independence, a few important Mexican historical figures and the government of Mexico. Learn about the famous Mexican muralist, Diego Rivera, the Mexican holiday, “Day of the Dead,” and some of the music heard around Mexico. Watch as Lydia takes Jason to Paracho to learn about Mexican arts and crafts, including the intricate work of guitar making! 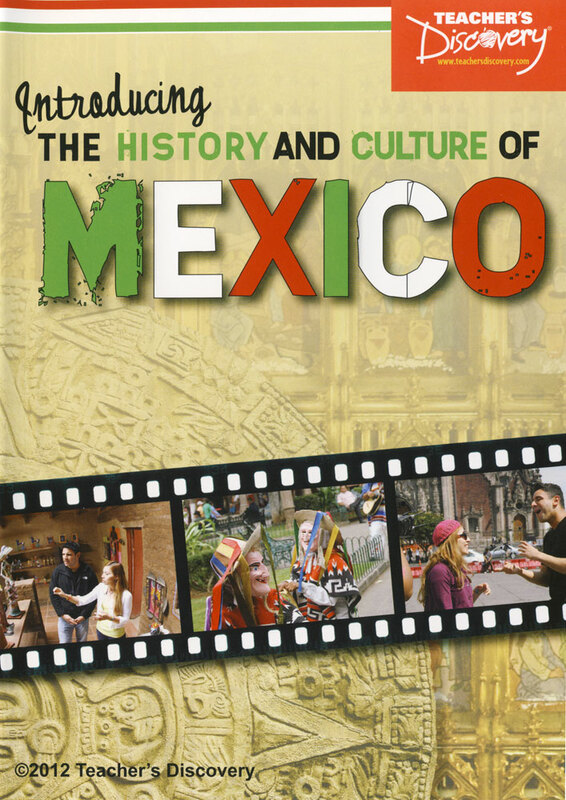 Filmed in documentary style, this is a great introduction to important parts of Mexican culture and history! ©2012. 30 minutes. English with some Spanish vocabulary. Not rated. All levels. 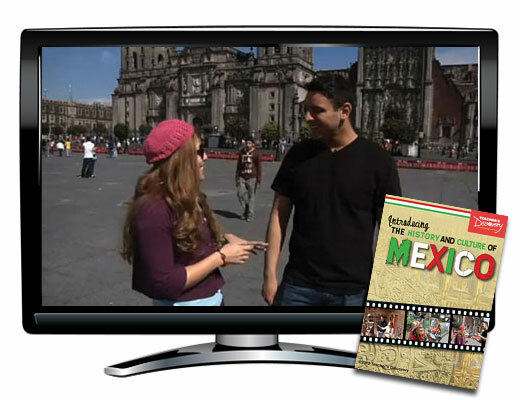 A perfect companion to the Introducing the History and Culture of Mexico DVD!  A collection of custom-created activities designed to help support vocabulary reinforcement, classroom discussions, and cultural awareness. 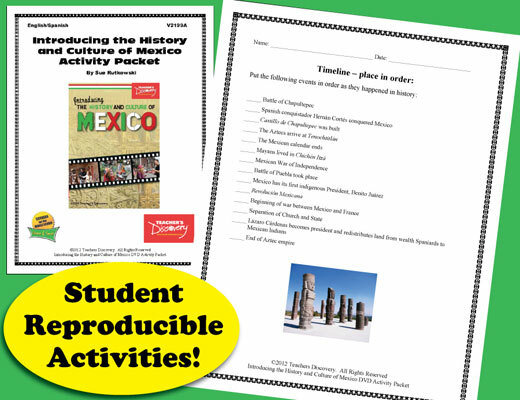 Reproducible activities include word puzzles, matching, fill in the blank, video bingo, vocabulary, time line exercises, map activity, rapid response game, sentence creation, Maya discoveries, comprehension lessons and more! ©2009. 23 pages. English with Spanish vocabulary. Beginning level. Reproducible. Great way to introduce kids to Mexico. We always use the video view sheets to reinforce information. Questions go with the DVD in chronological order. Kept students focused and on message as they watched the DVD. Kept my students' interest. Appropriate for high school students. I really like that this movie features two teenagers - my students don't find it too babyish nor too boring.  There is a lot of good information, and key vocab is highlighted. However, it is very quickly paced and covers A LOT of different topics. 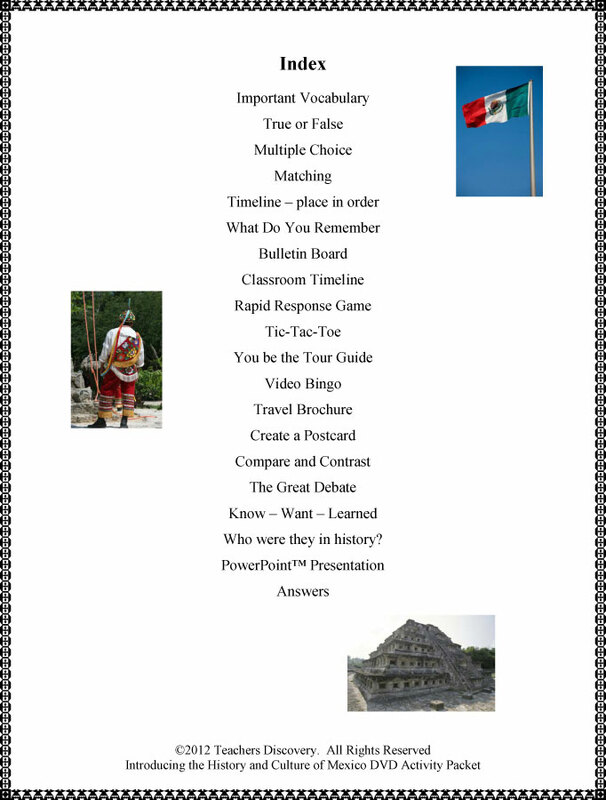 I use it to get students thinking about different ideas (cultural foods, foreign currency, etc.) as well as to see that life in large cities in Mexico is perhaps not AS different as they often think. I think it's appropriate to both MS and HS.